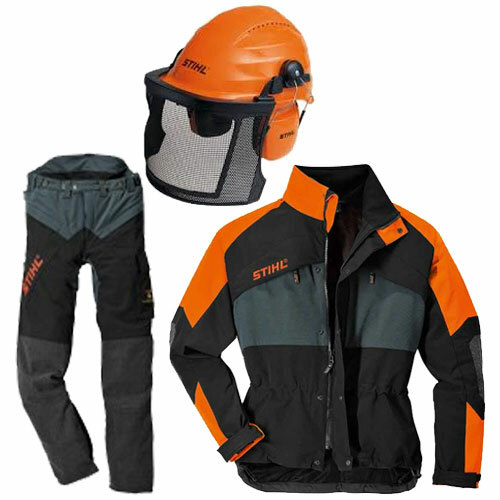 When it comes to protective safety clothing Stihl are at the fore-front. No matter if you are a domestic gardner or mainstream contractor safety comes first, this is achieved by using the correct, high quiality equipment, correct working methods & wearing comfortable, specifically designed safety clothing. Chainsaw protective clothing. One of the most comprehensive ranges on the market. Brush Cutter & Hedge Trimmer clothing & braces. Head, face & ear protection. Safety glases & work gloves. General accessories & sundry items. Stihl pride themselves on 4 key values. Safety, Innovation, Practicality & Usability. Celtic Mowers highly recommends the correct safety wear is worn at all times when using / operating any machinery. So for expert advice please ask.